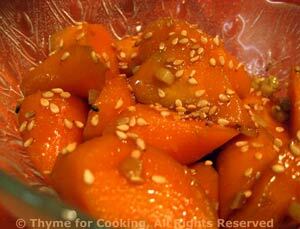 Thyme for Cooking easy vegetable sides, Sesame Carrots. Carrots are the workhorse of the vegetable world, at least in my kitchen. But that's no reason why they can't be interesting. Peel carrots and roll-cut: cut the end off of the carrot at an angle, roll carrot 1/4 turn and cut next piece about 3/4 inch away at an angle, roll 1/4 and cut next piece, etc. This gives you interesting looking pieces with lots of surface. Heat sesame oil in a small nonstick skillet over medium heat. Add garlic and sauté briefly - 30 seconds, or so. Add carrots, ginger, soy sauce and chicken stock, cover and simmer over low heat until carrots are tender, 12 - 15 minutes. Remove cover, increase heat and cook off any remaining liquid.